Plant Circadian Networks: Methods and Protocols provides a collection of protocols to investigate clock-controlled parameters including transcript and small RNA levels, promoter activity using luciferase reporters, protein levels and posttranslational modification, protein-protein interaction, in vivo DNA-protein interaction and RNA-protein interaction, cellular redox state, Ca2+ levels, and innate immune responses. Furthermore, the use of bioinformatics resources is described to evaluate high throughput data sets and to integrate the data into an overarching picture of circadian networks in the cell.Additional chapters focus on seasonal processes like flowering time control, and techniques on trees, moss and algae. 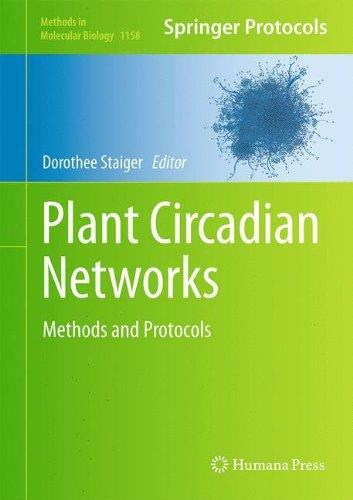 Written in the highly successful Methods in Molecular Biology series format, chapters include introductions to their respective topics, lists of the necessary materials and reagents, step-by-step, readily reproducible laboratory protocols, and key tips on troubleshooting and avoiding known pitfalls.Authoritative and practical, Plant Circadian Networks: Methods and Protocols is designed not only for the chronobiology community dealing with circadian biology but also for the plant community in general.